I just got back from a three day school camp with my youngest son. We went to new and interesting places each day, and everywhere we went, walking or driving, the adults were constantly serenaded by the same chorus when we arrived at each destination. Somehow, it seemed vitally important to be the first one to arrive wherever we went, or at least it was if you were under 10 years old. The playground is a useful place to hone skills and promote competition, but it is equally important to learn to work and compete together as a team. Often, when children compete in teams, you will have individuals claiming they were the fastest in the team, and therefore they are the reason the team won - so really "they" won and the rest of the team's efforts did not matter. Unfortunately, some people never outgrow this. They are in constant competition with everyone else, even though the others may not even know there is a race going on. They may not say it out loud, but they likely feel a small satisfaction in reaching the traffic light first, so they can be ready to launch off again - first - as soon as it turns green. Even as adults, some people within teams will promote their personal contributions to the detriment of the team - just like back on the playground, they believe that they (and themselves alone) are the real reason the team succeeded. It is true that one person can make a difference. It is also true that one person can help to bring a team together - or destroy it. Fortunately, most people do outgrow these playground behaviors, and become great team players. There is hope! In July and August 2012, the Summer Olympics were held in London England. While there were many events that featured the best individual competitors in the world, there were also many team events. To me, the team events were the most challenging and very exciting to watch, as it required the whole team to work together flawlessly under pressure under very specific deadlines, particularly in races where 1/10th of a second can mean the difference between Gold and watching someone else receive Bronze. Very tight competition. 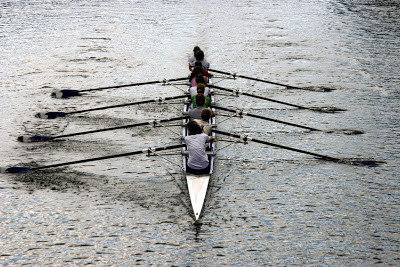 One competition that demands very high levels of teamwork is rowing - requiring precise coordination of every stroke with your teammates to apply the maximum forward force at exactly the same time. If your timing is slightly off or the pressure is uneven, the boat will veer off in one direction and then another, causing drag and loss of forward momentum - and no medals. Overall, Great Britain placed first in rowing with 9 medals (4 gold, 2 silver, 3 bronze). In second place was New Zealand, with 5 medals (3 gold, 2 bronze). In the Men's Double Sculls, the NZ team's lead over the silver winners was significant - NZ won by two boat-lengths. An exceptional show of teamwork and flawless execution. Every gold medal winning team performed to their utmost, an exhilarating mix of communication, trust, effort and coordination. However, there was one thing that was quite notably lacking around every medal winning team, gold, silver and bronze alike. Nowhere did you hear "I got there first!" When the team won - they all won together. The person in the front did not "win more" than the person in the back. Without every team member putting in their maximum coordinated effort for the common goal, they would not have achieved a world-class standing. You may not be competing on the world stage, or even going for "global project of the year", but it is just as important for your project team to work well together towards the common goal. True, you may have a number of shining stars on your project, the anchors that you can rely on to work a bit harder when needed, pull the long hours, and some that are exceptionally gifted or skilled. Certainly the Olympic teams were not filled with mediocre athletes - they were all of the highest calibre. What makes them - and effective teams - different from the playgrounds of our youth is the maturity and strength to put the good of the team first. 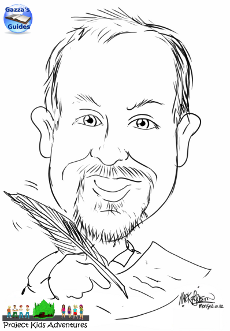 If we win - each team member can be proud to be part of the winning team, without "I's" popping up like seagulls. No one person or few people should take the credit. It is shared and enjoyed equally. And if we lose, nobody points fingers at who did the worst, or who they think was the "weak link". There may indeed be a few who did not seem to contribute quite as much as the others, however they may have actually been doing their best. Teams need all kinds of people in order to get the job done, with the associated mix of abilities, skills and attitudes. Leadership also makes a significant difference to overall performance of the team. If the team leader, manager, Project Manager or CEO takes all the credit for the work of their teams, it will demoralize the team. Similarly, if there are problems and the leader shunts the blame onto the team, the team will quickly dissolve into clusters of individuals and small groups steeped in resentment. The leader just destroyed the team. I learned a valuable lesson from my first Manager and Effective Leader - if there was success, he did not claim credit but publicy bestowed praise on the entire team. If there were problems or failures, he accepted them as his own in public - and then convened the team to see what could be improved or what needed to be done to fix the problem - together. Attitude, more than individual ability, makes the difference between a "good" team, an "Exceptional" team and a "poor performing" team. Where teams struggle from internal divisions and bickering, you will usually find a room full of egos, who are all clamoring "I was first!". While they bicker, the other teams sail on past to collect the medals. Park your ego at the door. You may have exceptional skills and experience - but you have been invited into the team to give your all and do your best so that we can succeed - together. Besides, your own exceptional skills may actually be middle of the pack in "our" high performing team, so don't crow too loud. Sit down, grab an oar, and help pull the boat forward. 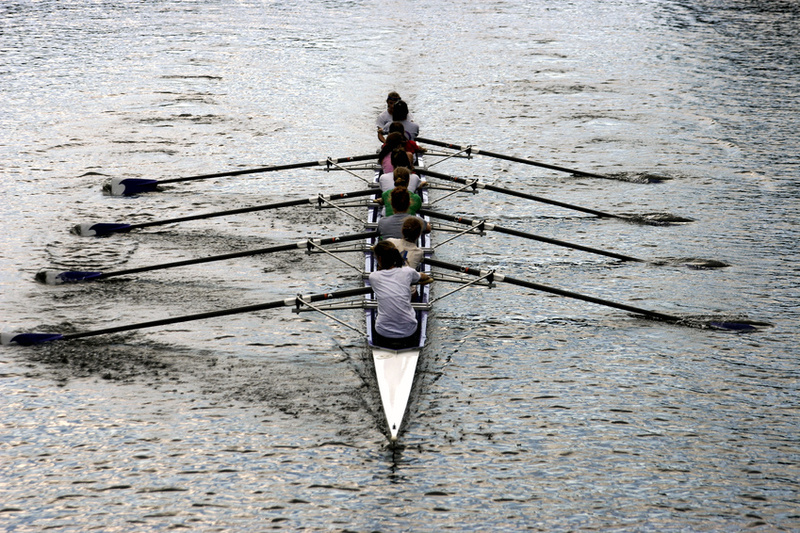 Good luck with your projects, and remember it is the whole boat (or team) that wins or loses - not just the person at the front. I too am tired of the constant fight to be first. To bipass you, and you, and you... To overtake everybody. Well people, no more!! I'm not playing the game anymore. I'm here for the ride. Not the prize. All of you forgot that the way to, is the deal. Enjoy it while it lasts, because it will not last forever. A few of you will overtake everybody and achieve what? More fame? More money? So what?!?!?!? I've had my share of both, and frankly, it's not worth the trip. Think of all the friends you lost on the way, the sights you didn't enjoy... Is it worth it? Frnakly, NO!!! It's up to us to stop this mad race for nothing... Let's do it together!